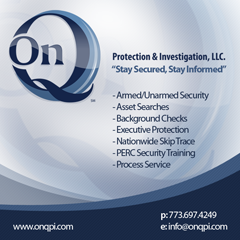 At ONQPI one of our primary functions is to provide the highest quality executive protection in Chicago. Corporate executives, celebrities, dignitaries, high-profile individuals and their families are increasingly at risk of kidnapping, criminal assault and miscellaneous threats. ONQPI Executive Protective (EP) Agents are experienced and trained to reduce these risks while maintaining a regular routine; discretion is our primary focus. Recruited from the ranks of the military, law enforcement and private sector, ONQPI EP Agents are held to the Highest Standards. They posses a wide range of mental and physical skills developed through extensive training and real-world applications. By emphasizing preparation over brute force, our EP agents implement proven best practices to identify threats and reduce risk. ONQPI provides Executive Protection Services like no other. We have EP Agents who are EMT’s, Paramedics and certified in First Aid, CPR and AED at the bear minimum. The key to minimizing risk is through Advance Work by visiting all points of a principle’s itinerary prior to his/her arrival; our Agents assess threats and gather protective intelligence, and then write a security plan that includes primary and secondary routes, nearest trauma hospitals, safe rooms and evacuation points. ONQPI Agents meet in advance with key personnel at each location and always have back-up plans ready to avert a possible threat. ONQPI Executive Protection services are tailored to the following levels of protection: High Threat Protection, Medium Threat Protection or Low Threat Protection.